The famous physicist Richard Feynman once said: “I learned very early the difference between knowing the name of something and knowing something.” The applicability of this emerged in the project, for at the start it was assumed that teachers and learners of the Pongola Circuit would easily access the facilities of the Phongola Education Centre, from where the project is run. But this was not the case for the seven schools in Altona, one of the four wards making up the circuit. The schools themselves are scattered, separated by a minimum distance of eight kilometres, and all located about eighty kilometres from the education centre. Transport to Pongola is “scarce”; in fact, the nearest town that people visit for their needs is Piet Retief, in the Mpumalanga Province. The project therefore had to change its strategy: if the mountain (in the form of the Altona ward schools) won’t come to the project, the project must go to the mountain. 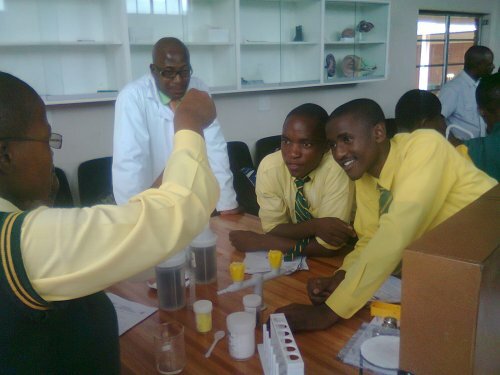 In July, MIET AFRICA’s project tutors ran a five-day intervention in Altona, at which 74 learners from the seven high schools in the ward were brought together and given focused tuition on Mechanics (Physical Science) and Trigonometry (Maths). Tuition included formal assessment in both subjects and feedback was prepared for the schools in form of report and learner performance analysis. Other news is that in September, inspired Mathematics teachers in the circuit will be launching a branch of AMESA (Association for Mathematics Education of South Africa) in Pongola. AMESA, which is the highly respected professional body for Maths education in South Africa, represents the interests of the discipline at provincial and national level.